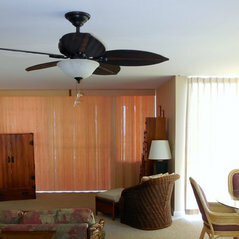 Whether you are looking for custom draperies, horizontal blinds, vertical blinds, valances, natural woven woods, shutters whatever you want to coordinate with your current home decor or to completely redecorate your living space or sunshades for your lanai, we are here to help you create those perfect window treatment solutions. 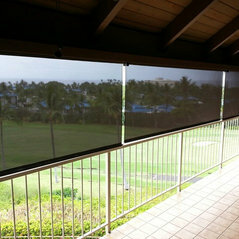 We carry Hunter Douglas, Horizon Window Fashions, Skyco, ADO, Skandia, Custom Brands, Kreative Kama'aina and other top of the line manufacturers. And we carry drapery fabric from Robert Allen Designs and Kravet. We work hard to offer creative and competitively priced solutions for your home. 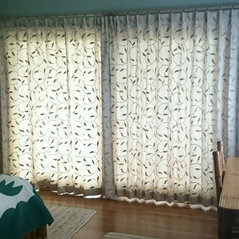 After all you are not just trying to cover a window but designing a look for your whole home. 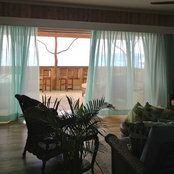 Check with us often as we continually add new window treatments for you to choose from. Your own unique style is the most important element for any type of home design. We provide a broad selection for all interior decor styles, designing a custom window treatment is always the best option for a unique look. We are professionals with years of experience to help with the process. Typical Job Costs:USD 200 - USD 50,000all quotes include tax & shipping. 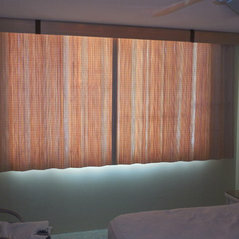 We also arrange for the installation, the installer we use has his own business, so clients pay him separately.